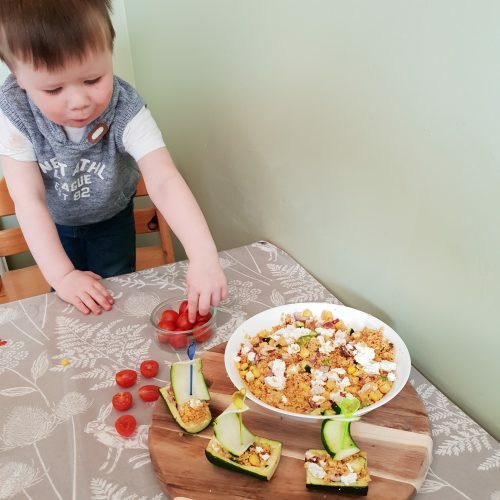 These courgette boats are a really fun way of serving lots of veggies and healthy goodness to your fussy little eater. To make 5 boats and some extra couscous for a hungry parent. You can also add cooked chicken if you wish but it’s not essential. Cut the ends off the courgette then cut into three equal cylinders. Cut each cylinder in half. Scoop out a well in 5 of the pieces of courgette to make ‘boats’. Peel the 6th piece of courgette into slices length ways to make sails for the boats. Make up the couscous using the veg stock as per packet instructions. Add the mixed herbs, mix well, cover and set to one side. Cut the peppers, red onion and any left over courgette into small pieces. Place on a baking tray with the courgette boats under the grill until soft. Mix the vegetables with the couscous (add the chicken now if you are using it). 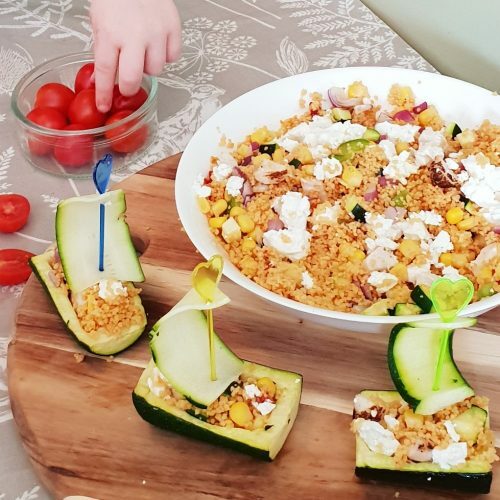 Fill the ‘boats’ with the couscous and veg then crumble the feta over the top. Use a party pick or a cocktail stick as a mast, poke it through either end of a courgette sail then stand it up in the middle of the boat.